Measure A will provide $455 million to South Coast jurisdictions and agencies over 30 years. The incorporated cities of Carpinteria, Santa Barbara and Goleta along with the unincorporated communities of Summerland, Montecito, the eastern Goleta Valley and Isla Vista will receive more than $270 million for needed road repair and maintenance over the next thirty years. 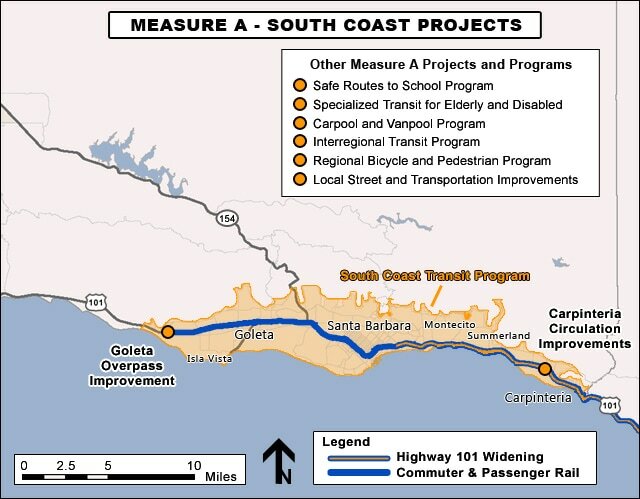 The Measure A program provides new funding in the south county for safe routes to school, bicycle and pedestrian projects, new local and commuter bus service, passenger rail improvements, carpool and vanpool programs to take cars off the road and reduce congestion and expanded transit service for seniors and the disabled.